Advertising online requires a diverse set of technical, written, and artistic skills that many nonprofits might not have access to. Facebook Ads for nonprofits is no different, but we’re here to help get you started. 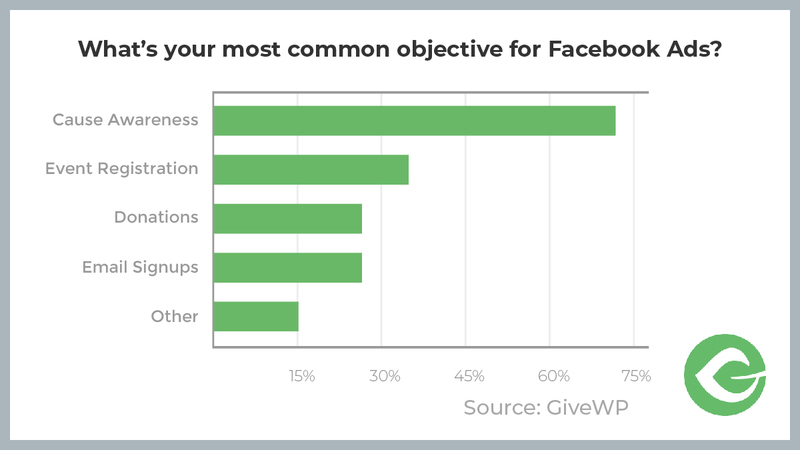 We have experience creating and managing Facebook ads for a wide range of purposes, but we wanted to get to know more about nonprofit ads specifically. To get a little more information from a diverse range of organizations, we asked nonprofit professionals about their experiences. 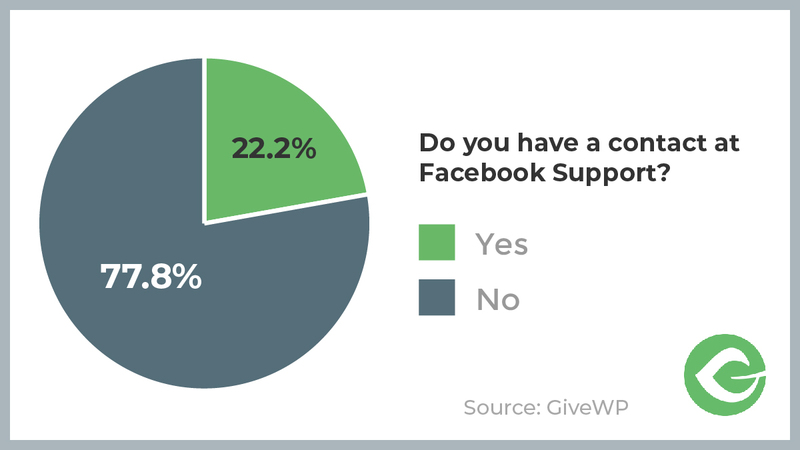 The Facebook survey is still open to responses so that we can continue to collect data on other uses for Facebook as a nonprofit and update this post later on. So, feel free to submit your answers. Here’s a summary of everything you need to know about advertising on Facebook as a nonprofit. First, why advertise on Facebook? Some claim no one uses it, the quality of content has gone down, etc. But that’s not true! Facebook has over 2 billion monthly active users. Even if your cause is local, the chances your audience is already on Facebook are really high. So, you should be advertising there. Overhead costs can generate more donations, which justifies the cost of spending on advertising. Yet, many fundraiser organizers still avoid this tactic. If necessary, rethink the way you think of charity with this TED Talk from Dan Pallotta. We tell for-profit sector to spend, spend, spend, on advertising until the last dollar no longer produces a penny. But we don’t like our donations spend on advertising in charity… As if the money invested in advertising could not bring in dramatically greater sums of money to serve the needy. Your organic reach is limited. Ads help you find other people like your supporters with targeting. Facebook allows you to use small budgets. There are multiple formats to fit all kinds of needs. You can set specific goals, like driving traffic to your donation page, email signups, page likes, etc. The bottom line is that Facebook is a great space for nonprofits. Facebook’s ad goals can help you accomplish your fundraising, event registration, email newsletter signup, volunteer signup, and other organizational goals. How you use Facebook Ads is up to you and there are many tools to think outside the box. Some of the most common ad objectives are to spread cause awareness, but we found that many nonprofits also ask for donations, event registrations, and email signups. The key to running Facebook ads is two fold. 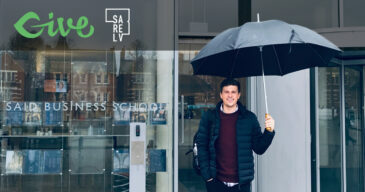 The most common mistake nonprofits make is in only promoting things that are important to them, such as a fundraising appeal or event registration. When in fact those rarely ever have a good ROI. A better way is to be posting at least a story a day, usually curated news connected to their mission. And then using Facebook ads to reach more people with it. While they are running ads they will also want to make sure they invite all the people who reacted to those posts to like their page so they build their following. They can do this by clicking on the reaction count on the post and it will pull up a list of people who reacted and if the don’t yet like the page will have an invite button next to their name. It’s important to align your ad objectives with your overall organizational goals. But make sure you also remember to include your story, the piece that’s most important to your supporters. This will help you to capture the attention of more people like them and get them to like or follow your page. You can also sprinkle in ads for your own goals, but they will likely convert less than those promoting your story. Is your nonprofit growing and does it need more eyes on it? Then you can generate cause awareness with page likes and email signups. Is your nonprofit trying to reach a fundraising goal? Then you need to target website visits and conversions, or donations if you use Facebook Fundraising. Talk with your board, your team, and your volunteers on what your organization might gain through Facebook ads. By involving everyone, you will get more outside the box ideas and likely see better results. But remember that data has shown nonprofits do better on Facebook when they use their ads to promote their story. As a nonprofit, Facebook advertising policies might impact you even more than a normal business page. 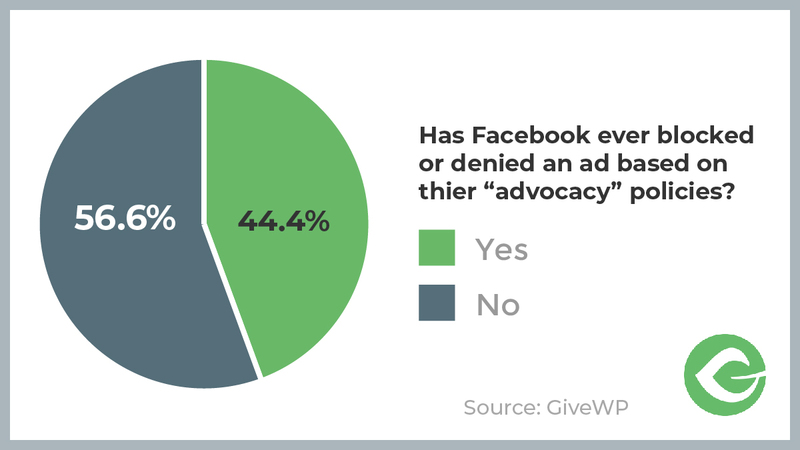 Many nonprofits get blocked by Facebook’s “advocacy” policy, which is difficult to navigate. If you’ve ever been denied due to advocacy rules, you’re not alone. Facebook has a lot of ads policies, conveniently outlined on their own ads policy site. However, even with all the policies laid out in front of you, it can be difficult to understand them all. It isn’t extremely clear how you can run certain kinds of ads. If your organization is political in any way, there’s a separate website dedicated to political and government advertising policies. So no matter where you look, there are long drawn out explanations of the policies. The one we’re most concerned with is their advocacy and national importance policy. If your ad flags this trigger, you have to have a verified profile to run your ad. Facebook’s definition of advocacy and national importance are very broad and usually nonprofit causes are in this category. So it’s a good idea to get approved before you run your ads no matter what. Basically, Facebook is strict. Your ad photos should have minimal text. Your language needs to meet certain standards. Targeting has to comply with certain restrictions. The list goes on. We recommend starting with Facebook Blueprint Courses and getting your profile approved to run political/advocacy ads. Buying ads is always tricky if it’s not something you do every day. The Facebook Ads platform also gets more complicated with each update. Most commonly, the impulse is to just click the blue boost button and set it up quickly. However, most experts advise against using the boost button. I recommend never using the blue boost button, rather setup a facebook ads manager account, using Facebook Business manager. Then use saved audiences using interests and demographics to create segments of different types of supporters. For example older women who like cats, younger men who like dogs, etc. Then when a post has strong organic engagement rate, anything over 5% is good, create a new facebook ad campaign, with an ad set for each audience, for that post and let it run for 3 days or so with say $5/day per audience. The results will be phenomenal. If 5% seems too high for your page, our own co-Founder and advertising expert, Jason Knill, recommends using posts that have above 2% engagement rate. The bottom line is, if you’re choosing the posts that connect to your supporters most then they’re more likely to perform well in ads. Inviting the people who like your post to like your page keeps them around longer and they will see more of your asks in the future. By doing this consistently, it gets lots of people to send signals to facebook saying they like the stories that page is posting. So they tend to see more of the stories organically. So the important fundraising asks made in the future are seen and shared by many more people who are highly connected and engaged. Use Facebook’s insights to look at the audience interacting with your ads and organic posts. This data should help you to refine your audiences and ad copy/creative. 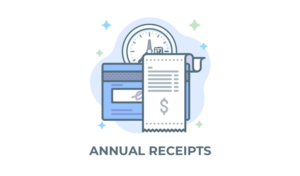 Following this process will ultimately save money on your ad spend. Separating each audience into its own ad set it also allows for deeper insights into how distinct audience segments are responding to the promoted stories. So they can fine tune or even stop trying to reach those people if the cost per engagement is too high for that group of people. As a nonprofit, you want to make sure that any money you do spend on ads is well-spent and maximized. Your goal should be to reach and convert more people with less money. Every single person gets an ad rejection at some point in time. Whether the decision is due to advocacy policies or not, it will happen. Facebook recommends you review their reason for denial and the policies it cites. Then, edit your ad and appeal their decision. If your ads were denied for advocacy and your page is not yet approved for advocacy ads, you need to go through an approval process. Depending on which country you are in, the process for running ads of “political nature or national importance” requires an approved application in advance. Submit an appeal (without editing). Change the language in the ad and resubmit. Reach out to a Facebook contact. Become an approved advertiser through the verification process. Give up and try creating another ad later. The best thing you can do is to contact someone at Facebook support. Most likely, you don’t have a one-on-one contact at Facebook. But if you work on getting one, it will greatly benefit your organization. Those who do have a contact at Facebook support are much more successful in their advertising efforts. Use targeting and analytics to hone in on optimizing. Test ads with small budgets. Some of the most useful advice we got from our survey respondents is best left in their own words. 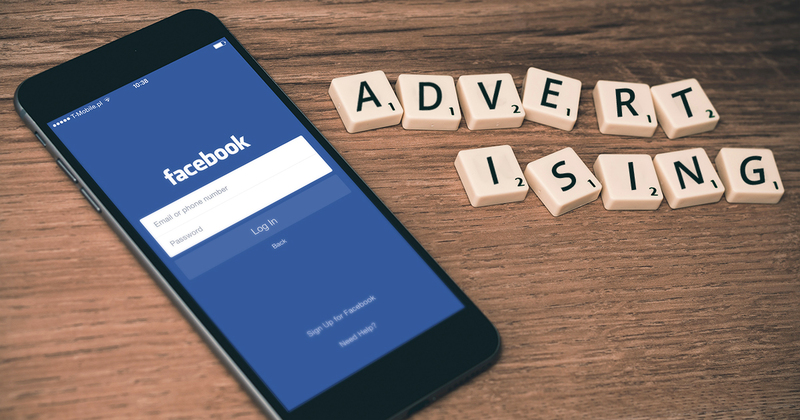 Below are more tips for your Facebook Ad campaigns. Test your target audience with smaller budgets until you find what works. I also strongly advise not advertising on Instagram unless you are advertising a product. It’s just not the venue for fundraising. Test ad copy/images/CTA on small scale first before rolling out larger spend. Let data be your guide! Facebook’s support forums are extensive, and a great resource. Of course not everyone has the luxury of time to search for the correct answer, but I generally get answers through Facebook’s support inbox within a day or two of submitting questions. Also, you don’t have to use the full ad manager. Boosting posts, with the right targeting and call to action, is incredibly effective. Also, you know your audience best! How-to articles are great but truly understanding your audience is the most important factor to understanding how to successfully advertise your content/generate donations.